I love tradition. I’m slowly building up a whole range of things to do at Christmas with Dexter (and any future babies), starting with our advent calendar. We can’t buy the normal chocolate ones in this house as Liam eats all the chocolates in one go. I thought about one with just the pictures in but they don’t hold the same excitement. So when casually wandering around Hobbycraft, (as you do) I stumbled across this..
..and, well, It just sort of fell into my basket! You probably already know I enjoy my crafty things so I already had almost everything I needed to decorate it. Although it took me a few days of uhmming and aahhhing to decide what I wanted to do. I took out all of the drawers, painted the body of the house green and the roof red. Rummaged through all of my craft paper and decorated each drawer. 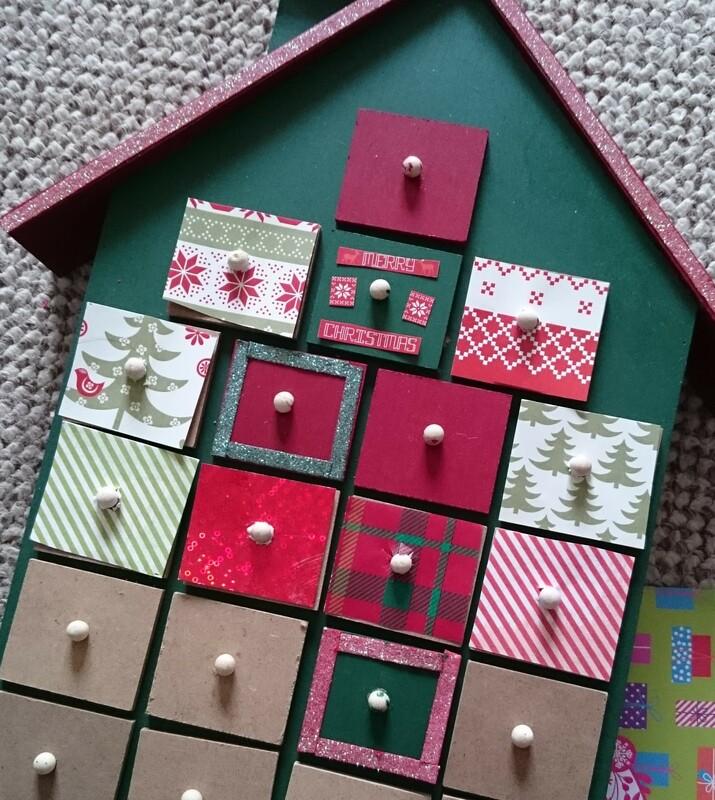 Then I attached mini gift tags to number the drawers and arranged them in the most pleasing pattern I could work out. Each drawer contains 3 small chocolates and a piece of card listing a Christmas themed activity for that day. I’ve worked out what activities we can do on which day, for example, going to visit Santa needs to be done on Liam’s day off so we can do that one during the day and all together. Another one would be driving around looking at Christmas lights in the windows. On days that its just me and the boy at home, I have planned lots of Christmas themed crafts that we can do. I’ll leave some for Liam to share with Dexter in the evening. I have a whole bunch of ideas in mind but I can share those with you throughout the month. December 1st will be dedicated to writing Dexters letter to Santa though as we still haven’t done it. I’m still so far behind. Where is everyone else up to? Still got lots to do? Likes, Loves and… Ice cream? Love this…I just accidentally bought it online too…I’d love to see the finished version for inspiration!